In this first installment, a local Indianapolis woman shares her story about her personal struggle with food and body image, even though she would be considered a “normal” weight person by most. Her story brings to light the eating disorders affecting women well into their 30’s, 40’s, 50’s and beyond. During the second installment, Tennie had an opportunity to sit down with local Indianapolis resident, Kris Green, who was featured in the first installment of the series. While she admitted to feeling addicted to food, and that she sometimes binges and even purges, she still didn’t feel she had an eating disorder. Kris simply felt she was overweight, which was causing her to hate her own body. 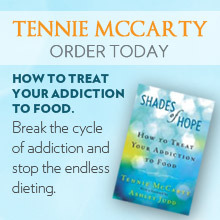 Tennie gets the chance to talk her through her feelings and bring to light her mental obsession with food. In the third installment, girls and young women open up to Fox59’s Jenny Anchondo about eating disorders during a focus group they call, “Girls Nite In,” where they look at the source of where girls and teens are getting messages about thinness at such a young age. Some of the girls admit to being body conscious as early as six and seven years of age, even one admitting she went on her first diet in the fourth grade. 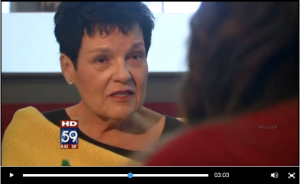 In the final installment of this four-part series, Tennie takes Fox59’s Jenny Anchondo to a restaurant and grocery shopping to talk about the eating plan she helped develop with dietitians here at Shades Of Hope Treatment Center. She offers up tips to free yourself from food and diet obsessions forever, such as, make your meals simple so you know exactly what they contain. And try eliminating sugar and gluten from your eating plan.